Social scientist Yankelovich (Uniting America) is a policy-minded pollster who has served on the boards such companies as CBS, ETS and US West. Here he takes stock of Enron, WorldCom, Tyco, Adelphia and other alleged bilkers, arguing that such companies are not just bad apples on a sound branch: the increasing permissiveness and deregulation of the business world, he argues, coupled with the stock market's increased emphasis on short-term shareholder value, has instigated a climate of unenlightened, all-consuming self-interest. Americans are thus faced with a stark choice between a free market or a civil society, but each vision is ""radically incomplete."" 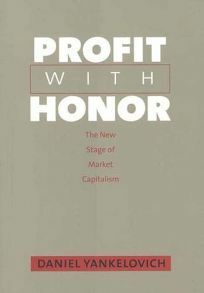 Arguing that the current climate for business is both harmful and unlikely to be legislated away, he proposes a new set of cultural norms dubbed ""stewardship ethics""-social responsibility, but without the usual self-righteous disdain for money associated with non-profits. Yaneklovich's guidelines evoke the usual business utopia, where employees and consumers alike return to trust in the corporations, but his slim volume is more visionary than practical, leaving interested parties largely on their own when it comes to implementing his ideas on stewardship.